Modules have been in a weird place for awhile. Specifically, modules don’t fit very well into the workshop economy. You can improve your workshops, but it doesn’t have much of an effect on the speed at which you can make new modules – this is governed by an obscure ‘construction’ skill that almost never sees enough use to get leveled. At the same time, we were facing an issue with certain workshops such as the carpentry workshop; there just isn’t a lot for them to do. Set them to auto-produce planks and forget them, basically. Lastly, there just weren’t a lot of ways for us, as game designers, to interact with modules. They’re either buildable or not. We want the ability to do things like give players modules that they couldn’t otherwise acquire. Happily there’s an elegant – and fun! – solution to all of this. It’s a new system coming this month; Boxed modules! Essentially modules, themselves, as a commodity. Boxed modules will be produced by workshops and then “unboxed” when needed. What?! I have to look at my carpentry workshop after the 5-minute mark now!?!?! Queue up the module(s) you want to construct in an appropriate workshop. A Boxed Module will be produced by your workshop using the materials that module usually requires. This’ll go into your stockpile or wherever people tend to dump things in your colony. 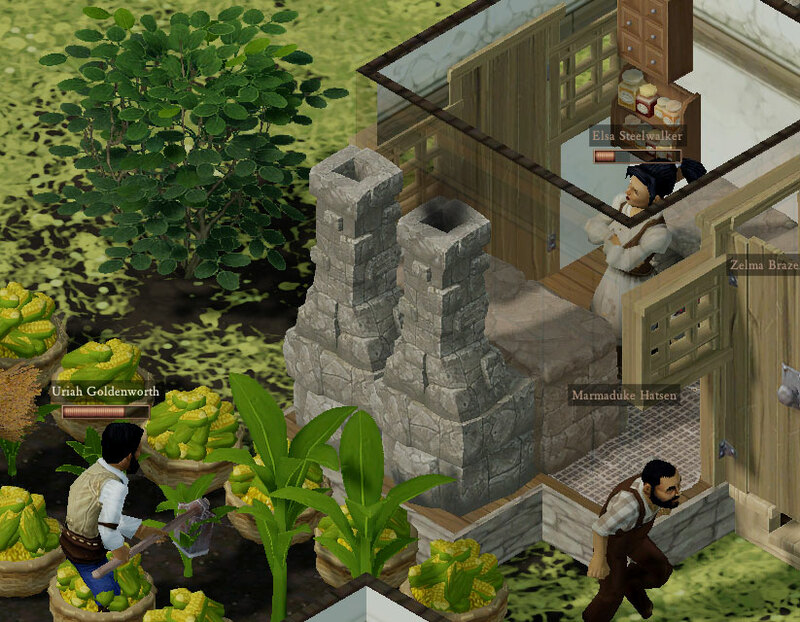 The next time you queue construction of that module (or if you have one already queued), someone will pick it up and quickly unbox it in the appropriate space! This will allow you to do things like produce beds in advance and then place them all at once, or (disclaimer: probably not in the first build) disassemble modules back into boxed versions to move them about. This has the additional benefit of tying into your overall progression! Have a skilled carpenter? A real fancy iron smelter? These benefits will mean faster production of modules for you – and that very production will help skill your overseers up. Lastly, we can use this system to enact Fun Stuff, granting modules via special conditions, like giving you a nice memorial plaque commemorating the time you got your entire military killed in a single battle. And hmm, what’s in that odd crate those Obeliskians dropped off…? This is a very interesting implementation. Are there going to be module storage piles? Are people going to be able to level there overseers just by having them pack/unpack ad nauseum? Is there any loss associated with packing something up (in my house we always break things when we pack them). At the moment modules will be stored in stockpiles like any other commodity. (Might not be a bad idea to add a filter, though.) Packing/unpacking will no longer use any kind of skill. As for a loss with packing something up… not for now. We’ll revisit it if it seems like it needs looking at, though. Sounds like a good system! It would be cool there was a way to label the boxes so that you can visually identify which modules are in them at a glance, without having to consult your commodities menu. At the very least, long-term I’d like art on the module crates indicating decor, furniture, etc., and possibly lower-class, middle-class, and upper-class as well. Sounds great. Reminds me of the way Dwarf Fortress handles buildings. Words can’t express how much I love this change. This is what i’ve been waiting. I’d have taken it a bit further, making workshops necessary for advaced module. Sure any run-off-the-mill bumpkin can assemble a cot. But a High Class Bed made of Gold bars ? doesn’t make much sense that anyone can make them. This would be nice, but i’d like the packages to be able to be built faster than regular furniture. 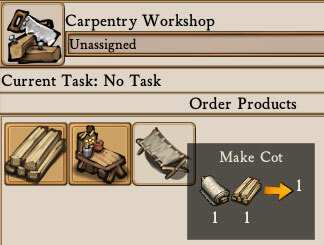 Wouldn’t make much sense or be very efficient for the colonists to have to make a bed twice. Building it in the workshop, then building it ‘again’ wherever its going? That’d be a huge waste of precious time and resources. Derp. I must’ve completely skipped over the part where it said thats exactly whats going to happen. I’ll just be… over here..